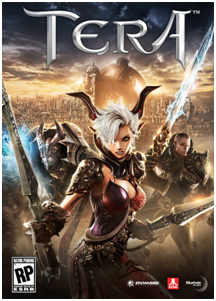 The Exiled Realm of Arborea (officially abbreviated as TERA) is a 3D fantasy themed MMORPG developed by Bluehole Studio. The game was released in South Korea on January 25, 2011, in Japan on August 18, 2011, in North America on May 1, 2012, and in Europe on May 3, 2012, with closed and open beta testings taking place before the launch dates. NHN Corporation, NHN Japan Corporation, En Masse Entertainment and Frogster Interactive Pictures publishes the game in these regions, respectively. With some patches the game receives a new subtitle. As such, it is also known as TERA: Rising and TERA: Fate of Arun. About a millennia ago two omnipotent titans Arun and Shara entered into formless voids and for reasons we can only guess, fell asleep. The mortal races didn't escape unscathed. Some—like the Sikandari, and most of the Giants—were wiped out but others rose from the wars such as the Barakas and Castanics. A metallic race from the underworld called Argons; their goal is to take over Tera and wake the titans to end their dreams and destroy Tera.